Natasha and Aiden clicked from the moment they first met at a party. 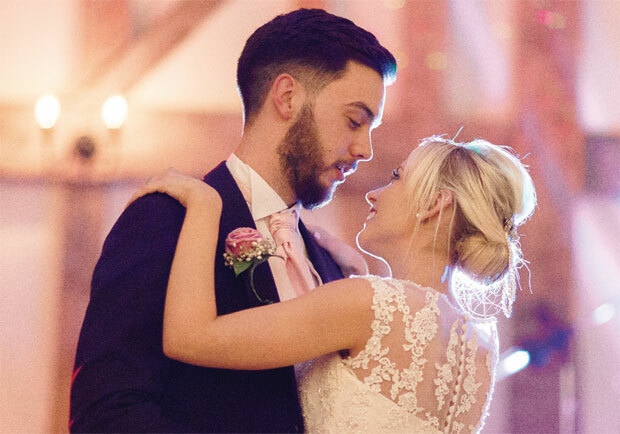 “We instantly got on well,” says Natasha. Two-and-a-half years later, Aiden popped the question at a Build-A-Bear workshop in Cambridge. “I put the ring on a chain around the bear. It was a complete surprise,” explains Aiden. 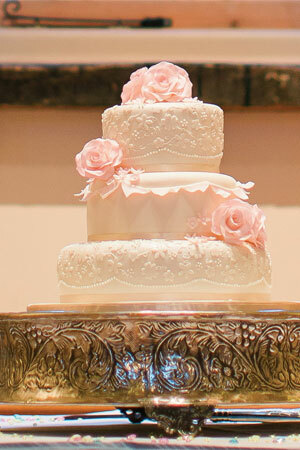 They tied the knot on Valentine's Day and opted for a pastel, vintage-style theme. 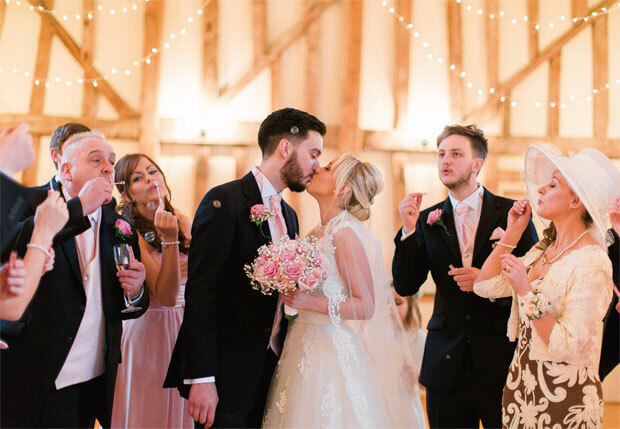 Beauty therapist Natasha did hers and her bridesmaids' make-up and the bridal party got ready at Clarice House in Bury St Edmunds, where she works. “We knew Clarice House would be a great backdrop for beautiful photos,” adds Aiden. 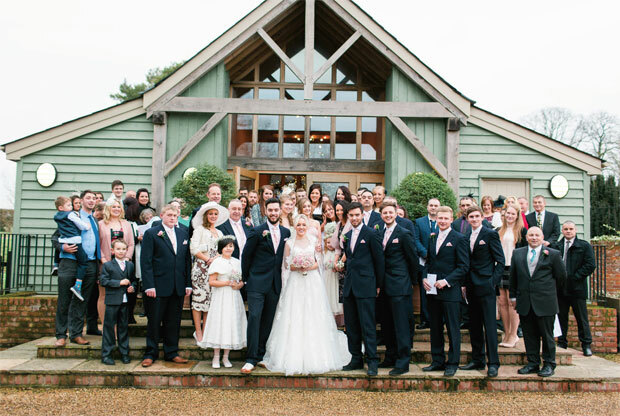 The Garden Barn was our dream venue; even the décor matched our theme perfectly. I completed my look with a Sparkle & Co pearl bracelet made with a charm of Aiden's fingerprint and a blue crystal for my something blue. I borrowed a pair of earrings from a friend and wore a pearl hair accessory. I wore Patience, a lace dress by Ronald Joyce. 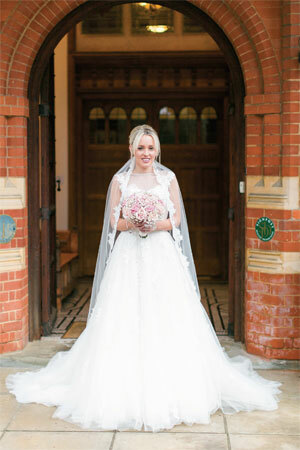 I knew I wanted a princess style and Brides by Solo adapted it perfectly to create my dream gown. We gave the bridesmaids present boxes, each containing a mini bottle of bubbly, a personalised bracelet and a heart-shaped, thank-you keepsake made by Sparkle & Co jewellers. 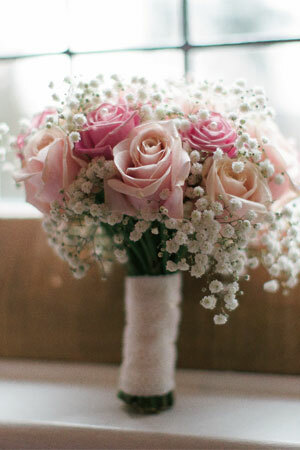 My bouquet was made up of pearl-studded roses and gypsophila. 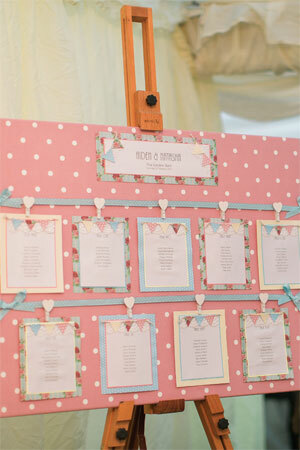 We attached bubbles to the order of service cards for our guests to use instead of confetti. 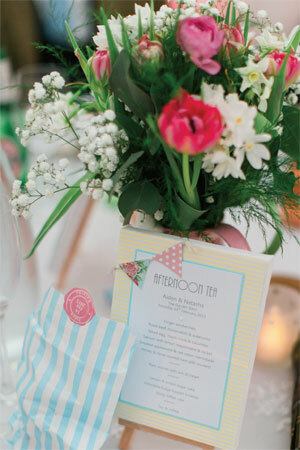 The favours were blue candy-striped bags filled with pastel coloured bonbons and sealed with a personalised sticker. Our centrepieces were made up of spring garden flowers including the roses and gypsophila in my bouquet. 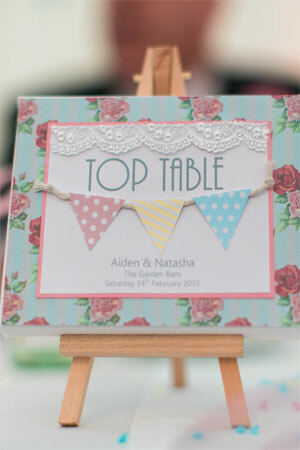 The bunting theme ran throughout the stationery including the table plan, with table names and menu cards to match. We had afternoon tea in a marquee attached to the barn straight after the ceremony and in the evening our guests tucked into fish and chips. 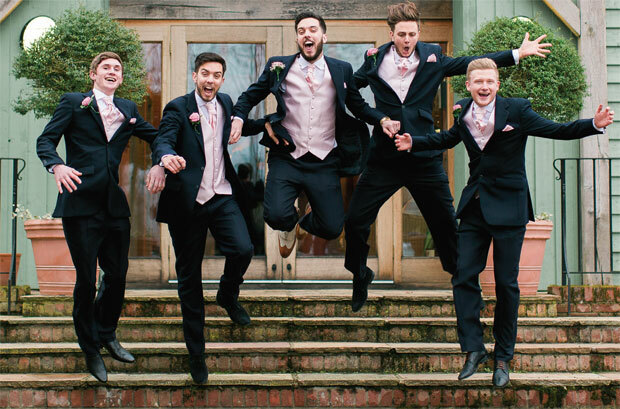 Aiden and his groomsmen wore navy blue suits with pink waistcoats and ruche ties to match the colour of the bridesmaids' dresses. 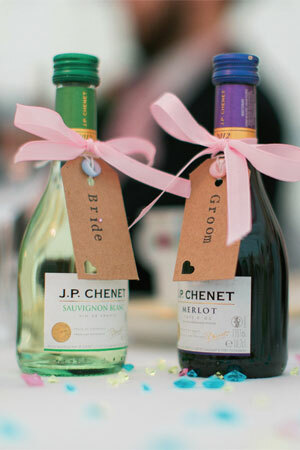 The place names were printed on luggage tags attached to individual miniature bottles of wine. 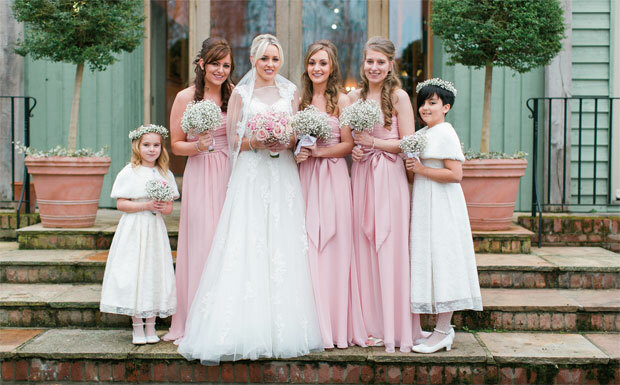 My bridesmaids wore Colour by Kenneth Winston long, chiffon dresses in pastel pink. 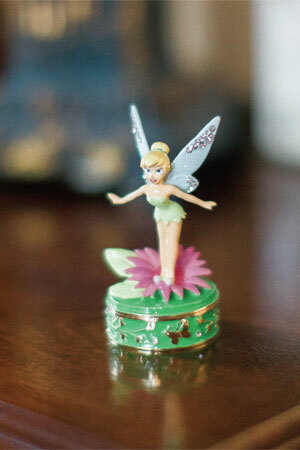 I found them on the internet and then searched online for where to buy them locally. Our three tier cake was decorated with pink flowers, bunting and a lace pattern, with carrot and orange flavour on top, white chocolate sponge in the middle and fruit cake for the base. 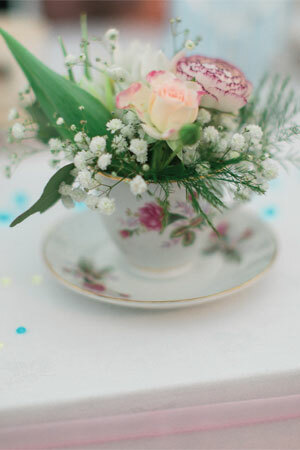 The caterers served our afternoon tea reception on vintage china and cake stands to match our big-day theme. Venue stylist Jane Webster supplied the lace tablecloths and our chair covers. Our first dance was to All of Me by John Legend.